Recently, several men’s rowing alumni reunited on Lake Quinsigamond in Worcester, MA for the Eastern Association of Rowing Colleges (EARC) Eastern Sprints Regatta. 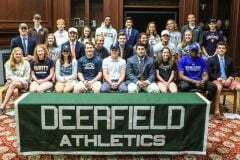 These nine alumni graduated from Deerfield between 2014 and 2017, and represented six of the 18 collegiate rowing teams in attendance, highlighting the depth of the Big Green rowing program. 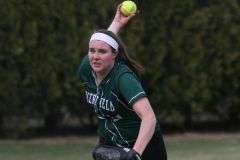 At the Eastern Sprints Regatta, two Deerfield alumni earned podium finishes, finishing in first and second place within their boat category. 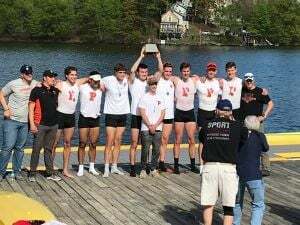 Gordon Johnson ’17 along with his Princeton teammates earned gold in the second varsity eight heavyweight boat, edging Yale by only a second at the finish line. Johnson is one of four first year student-athletes to sit in the Princeton 2V8+ heavyweight boat. This was the program’s third 2V gold medal in the last four years at the Eastern Sprints Regatta. In his senior campaign, Rich Caputo ’14 of Brown finished less than five seconds behind Johnson to capture the bronze medal. Caputo’s boat was one of two Brown boats to earn third place finishes at the Eastern Sprints. Former Big Green teammate and current Brown teammate Caleb Friends ’16 raced to a fifth place finish in the heavyweight fifth boat for the Bears. The Sanford brothers – Henry ’15 and Will ’17 – each collected sixth place finishes for Dartmouth in the heavyweight third and second boat respectively. Also finishing in sixth place was Freddie Johnson ’17 with Harvard’s varsity eight lightweight second boat. Another sixth place finish was earned by Penn’s lightweight fourth boat, which included Bryce Klehm ’15. First-year Penn student-athlete, Dani Michelson ’17 coxed the heavyweight second boat to a 13th place finish in his first appearance at the Eastern Sprints. In his first-year at the College of the Holy Cross, Luca Basile ’17 has established himself in the heavyweight first boat, which finished in the 16th spot at the regatta. Since the Eastern Sprints Regatta a few weeks ago, these alumni have shifted their focus on preparing for their final collegiate races of the 2017-2018 season at the Intercollegiate Rowing Association National Championship Regatta which began yesterday on Mercer Lake in West Windsor, NJ. Races will continue through June 3rd. Stay tuned for updates or tune in live to the IRA races!